Sign up for free and just shop with Biba as normal. Our average member earns over ₹5900 cashback a year. Celebrate the traditional womanhood with India’s fashion giant BIBA’s authentic ethnic collection of salwar kameez and dupatta exclusively for girls and woman. BIBA promises every customer the ethnic wears with the latest trendy touch in a reasonable price to add more color to your life. The unique name BIBA reflect a young and pretty Punjabi girl which as Mrs. Meena Bindra, the founder of BIBA says the perfect combination of style and confidence. The amazing journey of BIBA started in 1986 and made a huge difference in the society with self-designed quality products which made the authentic ethnic wears more popular and stylish. Today BIBA is also offering you the mix and match collection with a contemporary touch on Indian ethnic look by hand-block prints and vegetable dyes. This fashion destination provides the perfect traditional wear with supreme quality materials and traditional embroideries with all kinds of Salwar suits, which include Punjabi salwar suit, Patiala salwar suit, tops and different types of ethnic bottoms which make it as a perfect ethnic fashion destination of women. Still, would you like to know more about BIBA? Then check out the famous Bollywood movies such as Devdas, Baghban, Hulchul, and Na Tum Jano Na Hum to check out the most beautiful outfits done by BIBA. TopCashback gives you the opportunity to style yourself in the most popular traditional wears with exclusive cashback offers on BIBA dresses for a super saving shopping experience. Check out the following categories for a proper guideline for your shopping. BIBA provides the huge collection of new arrivals in all sections ranging from mix and match, bottom, dupatta, suit sets, jewelry, for both girl and women. BIBA provides a beautiful collection of ethnic suit sets including A-line, Anarkali, flared, and straight option in different length for the perfect fitting. Check out the trending collection of BIBA Kurtis and dresses plus the evergreen palazzos and skirts to style yourself in a unique way. Also, don’t forget to check out the BIBA Sale on fashion jewelry set which includes earrings, rings, bracelet, bangles and necklace to style you in the perfect way. The incredible mix and match section provides a wide range of tops, bottom, dupatta and suit sets with the perfect hint of contemporary fashion. BIBA gives the perfect collection of tops and bottoms ranging from traditional Kurtis, jacket, shrugs, Patiala, skirts, palazzos, and salwar to trending dresses, short tops. Tunics, jumpsuits, shorts, leggings, and pants for a complete shopping experience. Also, check out the amazing suit collection to get the perfect suit according to the fitting and shop via TopCashback to get the best cashback offers on BIBA dresses and fashion accessories for a budget-friendly shopping. Check out the stunning suit set collection from BIBA to select the perfect fitting suit for you from the awesome collection of A-line, Anarkali, asymmetric, flares, Kalidar, and straight suits to be the star in every function. Find the latest collections of BIBA suits raging from Punjabi suit, Salwar suit, Designer suit, Punjabi salwar suit, BIBA salwar suits, Patiala salwar suit. BIBA provides the wonderful collection of Anarkali and flare collection which is unique in designs and quality. Style you up with the latest BIBA A-line and straight collection for a simple yet royal look. Also, don’t forget to check out the asymmetric and Kalidar collection for an elegant style plus get flat 8.75% TCB cashback to save money while your shopping. BIBA gives you an exclusive section filled with girls ethnic wears ranging from Anarkali, skirts, palazzos, Patiala's, lehengas, suit sets, to trendy tops. Jumpsuits and shorts on top, bottom and suit set. Style your girl with the stunning flares and dresses for a stunning look and amazing BIBA Anarkali's and A-line Kurtis for an authentic traditional look. Check out the trending shorts and jumpsuits to dress your girl in a stylish look and shop now via TopCashback to get exciting flat cashback for a pocket-friendly shopping experience. BIBA easy stitch collection gives you the best collection of printed, embroidered, embellished dress materials at a reasonable price. Get your favorite materials and stitch it according to your fitting for a better look plus don’t worry about the sizes and be happy while shopping. Don't miss out to check the BIBA’s embroidery dress material collection for an authentic look. The stunning jewelry collection from BIBA gives you the amazing ethnic look according to your outfit. Check out the wide range of jewelry collection ranging from the necklace, earrings, bracelet to bangles and rings for the ideal ethnic look. Search for the suitable necklace and earnings from the thousands of various collection and get additional TCB cashback on top shopping via TopCashback. TopCashback gives you the highest cashback offers than any other online cashback or coupon code website. To save on your online shopping just sign up with TopCashback and shop normally we will track your orders and make sure that the cashback is credited to your account to give you amazing cashback offers and discounts for the best online shopping experience. So don’t miss the opportunity to save on your online shopping expenses with the latest BIBA cashback offers and discounts from TopCashback by adding our TopCashback notifier to your search engine. 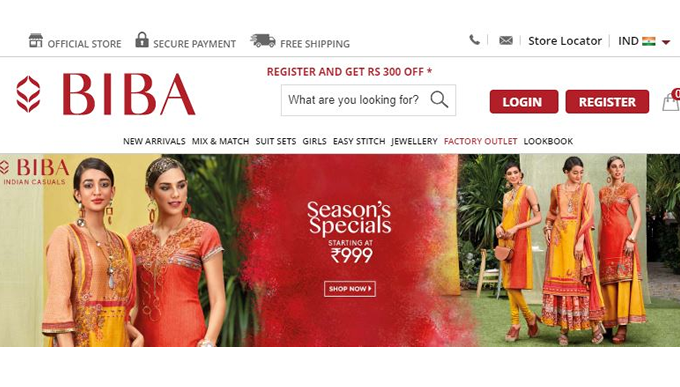 Biba Apparels Private Limited (“Biba”), the Indian fashion giant, stands true to its name. The brand has been dressing and embellishing demure maidens from every corner of India since 1986. Contemporary ethnic fashion at affordable price is Biba’s commitment to fashion enthusiasts, offering ladies’ churidars and dupatta sets in cotton, in shades of every color, and with irresistible color combinations and patterns. Mix-and-match kurta pieces from Biba are available in different lengths, so you can experience the joys of traditional Indian wear regardless of your body type. The word “biba” is a Punjabi endearment for a young and pretty girl. It implies sublime qualities, compelling Mrs. Meena Bindra, the founder of Biba, to use the name for the line of salwar, kameez, and dupattas that she launched in 1986. What began as a fashionable and affordable line remains the brand’s ethos today: fashion at affordable price.